As promised in last week’s post, Madness and Methods, here is my scorecard for week one of marathon training. 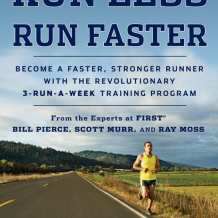 In case you missed last week’s post, here’s the basic background: I am using the training methods described in the book Run Less Run Faster to train for the 2013 Outer Banks Marathon on November 10. Despite not quite meeting the authors’ suggested speed for a baseline, I am attempting to train for the Boston Qualifier time for my age group and break 3:25:00. In this program, each week I will attempt three runs at the prescribed lengths and paces and complete at least 2 cross training workouts. 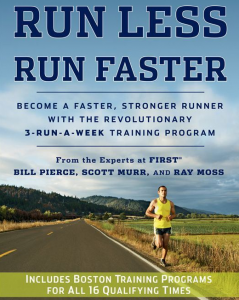 In the book, the authors actually refer to week one as week sixteen, since we are sixteen weeks out from race day. I will reverse the sequence, though, and call it week one. Here’s how I did. I’ll grade cross training on a pass/fail and I’ll give the run workouts a letter grade. Grade: B+ . Started after work at almost 7pm. Temperature was close to 90 degrees and muggy. Not terrible for South Carolina in July, though. I did take an Accel Gel at the house, then rode my bike very easy to the high school for my warm up – almost 5 miles taking about 22 minutes. I went way too fast on the first mile (don’t recall ever running a mile that fast), which cost me on the third. The last 1/2 mile really hurt. Need to be more consistent on the splits. Tough to do on the track, though. For cool down, I rode my bike back home. Grade: A. As you can see, miles 3 and 4 were faster than target. Afternoon thunderstorms in the area cooled the temperature to about 82 degrees. The last run for the week called for 13 miles at an 8:19/mile pace. Can’t say that I was too optimistic about this one. I was tired, and, unfortunately, Friday morning at 6am was the only time I was going to have to run in the coolest weather. So at 5:55am Friday, I hit the road. At this time of morning, it was still pretty dark, so I stayed in the safer roads of my neighborhood for the first few miles. This meant some bigger hills than I’d like, but I just looked at it as an opportunity for a negative split. Sure enough, I had a really great second half of my run and completed it in 1:47:29, an 8:14/mile pace. Surprised myself on this one. Overall, week one went very well, and I’m off to a good start. Physically, I have some muscles talking that haven’t spoken up for a while, but I feel pretty good. If week one is any indication, though, this is going to be as tough mentally as physically. Work, family schedules, and weather all add to the stress of hitting the workouts. In addition to the workouts, I worked hard on hydration, drinking plenty of water each day and cutting back my soft drink and intake significantly. I’m working on eating better, too, but that’s pretty tough. I did manage to cut out my morning drive-thru hash browns. Baby steps, I guess. I’ve also made sure to ice down my troublesome left foot in the evenings after runs, even if it feels fine. Run #2 worries me the most this week.